Taycor is proud to be one of the nationwide leaders in 100% software leasing and financing. Software infrastructure is critical to staying competitive in today’s technology enriched era. Taycor understands that software sometimes has to be built from the ground up custom tailored to fit your needs, or comes through the cloud in SaaS format. Each unique need requires a unique solution, and we aim to understand each need and come up with a customer solution that fits and makes sense. Software financing typically has an added complexity dependent upon the nature of how it’s delivered. Customization, subscription, or cloud based software all require expert advice and financing programs that ensure ease of upgrade/downgrade flexibility when needed, and maintaining as well as maximizing tax benefits. Get approved within hours, and with no commitment from an experienced licensed leasing and financing company. 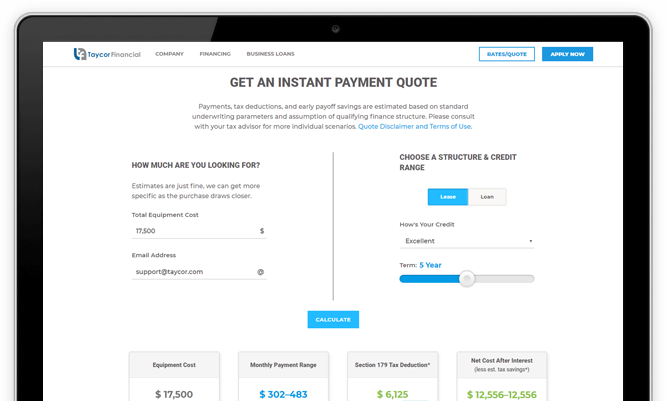 Get approved for transactions up to $150,000 with a simple application, no tax returns required. ** Low Documentation Application Only programs are for existing and well-qualified customers with well established borrowing history and credit. Please inquire with one of our Financing Experts for program details. *** For larger or complex project financing needs Taycor will often need a full financial package that includes Tax Returns, Financials, and Bank Statements.